Between 1672 and 1674 Dutch raiders, smarting from their defeat by the English and the loss of their colonies in what is now New York, carried out a series of raids on the coast of America. The Dutch fleet arrived in Ferryland, Newfoundland from New Amsterdam, which they had successfully recaptured from the British in July 1673. From Frank C. Bowen, The Sea: It's History and Romance to 1697, vol. I (London: B.F. Stevens & Brown, 1924-1926) 269. Original in Arnoldus Montanus, De Nieuwe en Onbekende Weereld, of Beschrijving van America (Amsterdam: 1671). 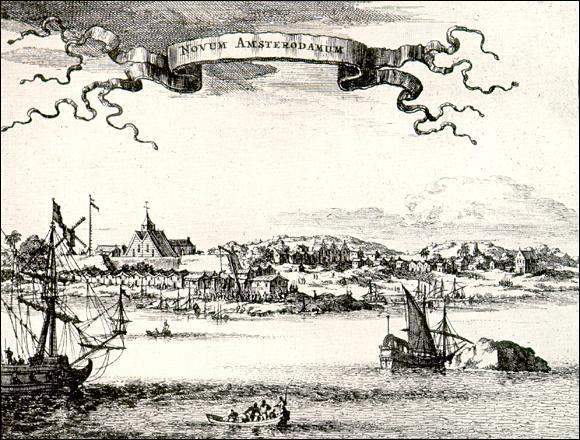 The Dutch vessels pictured here are similar to those which raided Ferryland in 1673. Detail from "The Battle of Schooneveld, June 4th, 1673" in Frank C. Bowen, The Sea: It's History and Romance to 1697, vol. I (London: B.F. Stevens and Brown, 1924-1926) 147. The Dutch landed at Ferryland without opposition, "...the fort being out of repair, and no commander upon the place," on September 4, 1673. Once ashore they "...plundered, ruined, fired, and destroyed the commodities, cattle, household goods and other stores belonging to these inhabitants following..." He listed 14 individuals by name and "many others." Among those whose property was destroyed were Lady Kirke, her sister Lady Hopkins, and Lady Kirke's three sons, George, David and Philip. The following day they burned 30 boats, took as much fish as their ships could carry and forced the inhabitants to send six hogs and one bullock to each ship in return for sparing most of the settlement. They also took away four "great guns," apparently not used in defence of the place. 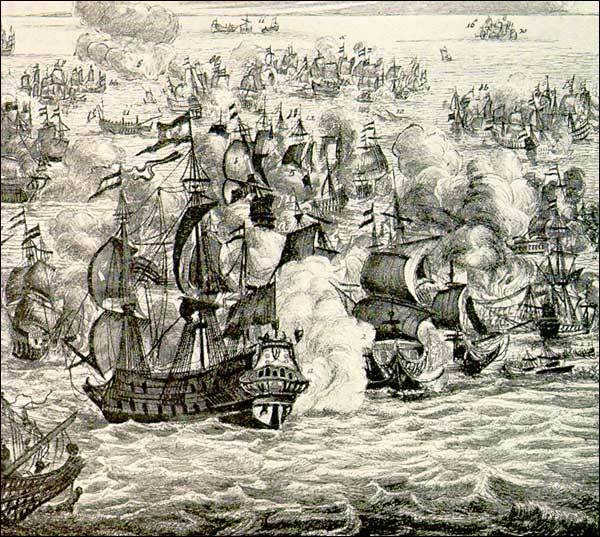 The Battle of Sole Bay marked the first naval engagement between British and Dutch forces in the Third Dutch War (1672-74). 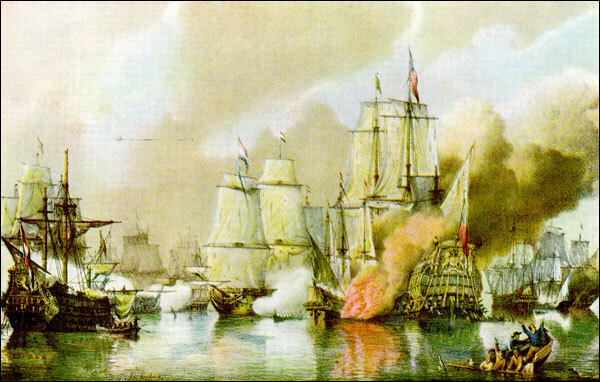 Following this battle, the Dutch ordered their vessels to attack English settlements, such as Ferryland, in the New World. From Frank C. Bowen, The Sea: It's History and Romance to 1697, vol. I (London: B.F. Stevens & Brown, 1924-1926) 145. No lives appear to have been lost during the raid and the inhabitants stayed throughout the following winter. There is no more specific mention of the damage inflicted by the Dutch at Ferryland, but at a place three miles from Ferryland they burned, among other buildings, a warehouse. Archaeology suggests that the warehouse built by the first settlers on the Avalon waterfront was destroyed about this time, and it is difficult to escape the conclusion that this violent destruction took place during the Dutch attack. 1. Lovelace, Dudley. '[Captain] Dudley Lovelace; 29 March, 1675: An Account of the Dutch Fleet upon the Coast of Newfoundland in the year 1673.' Great Britain, Colonial Office, CO 1/34 (37), 85. MHA 16-C-2-024. Transcribed by P.E. Pope.